edit: please bear in mind that this was a prototype made in a week. the commercial game i have now released based on it has the same basic idea but is considerably more advanced and more clearly explained. this prototype is not intended as a demo version. Successfully completed this seven-day roguelike. 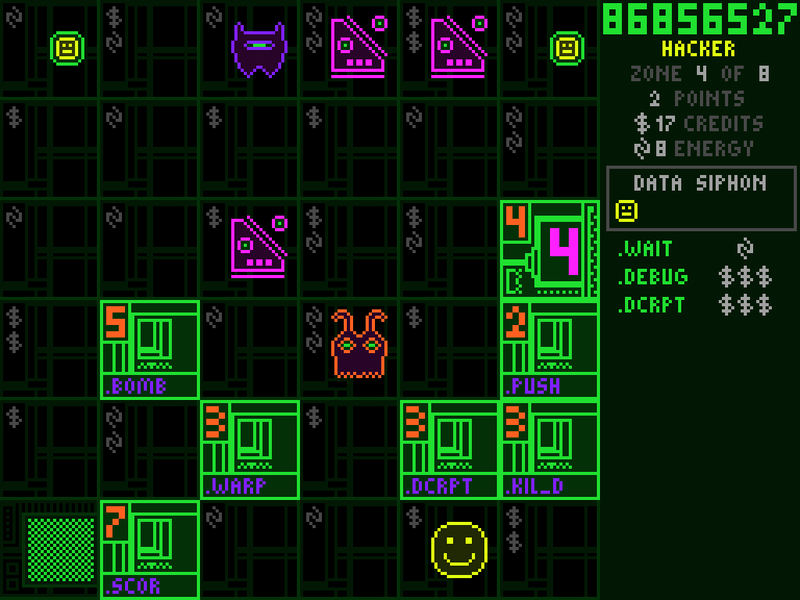 It's a CYBERPUNK HACKING GAME with COMPLICATED RESOURCE MANAGEMENT and LONG-TERM DECISIONS. - It's quite complex and I skimped on explanations so expect confusion. - The mac version doesn't work on older versions of the operating system (this is part of Apple's planned obsolescence hellhole; the latest version of xcode won't build for older systems but I'm forced to update to it because the older ones won't build for newer systems and I've been forced to update the operating system on my ipad so UGH; basically I have to have multiple xcode versions installed and I really can't be bothered untangling this mess right now so). - It might crash on completion. Or other times, who knows? - It might not be that well balanced, there's lots of costs to get right and I haven't played enough yet. I intend to spend more time on this and release a more finished version in a few weeks. - Arrow keys move, moving towards an enemy attacks it. - You pick up resources from tiles by using DATA SIPHON, which are the smiley faces you collect. - Siphoning floor tiles gives credits or energy, which are spent to activate programs. - Siphoning wall tiles gives programs or points. - The red number on a wall is how many enemies will appear when you siphon it. - Mouse-over walls/programs to see what they do. - Click programs (on the right sidebar) to activate them. edit: hahahah I said "a few weeks". anyway it's released on ios now and I'm still working on an updated PC version.. it's way way better now though! edit: now also available on steam. This is really excellent. Question: what does DEBUG do? TERMINATE OVERLAPPING. If anything overlaps, it is terminated. Fascinating! I figured out how to play through regimentation, which was a fun exercise. Looking forward to having this on my phone next to Zaga. I see what you've done here. Nice played. :) I especially like I have to pay to skip moving. The balance feels good btw. Also it's one of the most original games I have played. A great game! Pity it crashed at me when I've finally managed to complete the 8th stage. My build was like ATTK -> PUSH -> SIPH+ -> SCOR. Awesome game, really well crafted and balanced. It's great how it always makes you the agent of your own demise. Also loved the ending. Oh! This is magnificent. You've expertly distilled what I like most about roguelikes: careful management of resources, lots of build options, and short, highly variable iterations. I feel like .DEBUG is pretty critical to success where the other apps are less dependable in the long game. .BOMB exposes my cover, .WARP is unpredictable, and .PUSH doesn't help against viruses (I do love these tradeoffs). To be fair, though, .DEBUG's usefulness is contingent on map and enemy layout, so maybe it's not so versatile as I've been making it out to be. I'll have to play some more; I've only made it to level 5 so far. I'm really glad you made this and to hear that you're continuing on with it. You have a gift for clever systems that deserves broader recognition. I have a stack overflow/underflow problem reported. I also have a plain white screen. I do have sound, but can't see anything. Hmm, too bad, can't play it now. I am running Windows 7 on a Intel Pentium Dual CPU @ 1.80 1.80.
this is the problem with trying to everything myself! You've got the right idea: you use it, and then nothing happens. It's one of the best programs in the game IMO. now make a game where all the items do varying degrees of nothing! Man I love this game. Holy hell. - The push/debug combo might be a bit overpowered in the late levels where you can push a whole swarm of enemies into the outer walls (all on top of each other) and then just debug them out of existence. Push feels too cheep in general. - calm is great, and it's pretty much mandatory in the late game. - reset is also great and can make/break your midgame. Howabout another class that starts knowing .wait? Awesome work! Really interesting and original. High five.